I am certainly no food blogger but I really wanted to do this little post to share with you all the loveliest American styled food restaurant that I went to yesterday for a little catchup with Ellie & Ally which was called Byron. I can't remember who's post it was but not so long ago I was reading a post and someone said that Byron do the best burgers in town so I instantly knew that I'd have to visit when I next wanted to go out to eat. 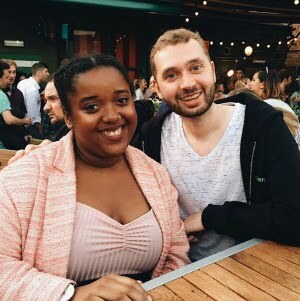 There are Byron restaurants located in Cambridge, Kent, Oxford and a staggering 28 around London so we were definitely spoilt for choice as to where we could go but opted for the Camden location. Inside is honestly such a cool and relaxed vibe with chilled music playing throughout and the cosiest little set up. We arrived at such a good time at around 2pm and there was hardly anyone inside so that meant we were seated straight away with the nicest view by the window and within moments we were handed the drinks and food menu. I decided to go for the classic hamburger with french fries which came to a very small price of just under £10. My burger was incredible can I just say, cooked to succulent perfection. I've honestly never tasted anything as tasty and it was so so juicy and don't even get me started on how perfect the french fries were. It was the perfect portion just to hit the spot. As you can tell from my photos, I enjoyed the meal so much and pretty much cleared my plate. I definitely recommend that you all check Byron out, money well spent I'd say. You can click here and see the different areas that it is located as well as the menu. Let me know if you go to Byron any time soon! I'd love to continue doing 'Food Friday' posts but they won't obviously be weekly as I don't visit restaurants that much. I actually enjoyed writing this post so much! Have you been to Byron before? are you thinking of visiting Byron? Have a good Easter weekend! Follow me on Bloglovin', Twitter & Instagram! Haha, I so wish I could have this whole meal again! I've never been here before, definitely have to check it out next time I'm in London! Please could you check out mine and subscribe? Haha, so true. ;) I think I'll definitely have to make these posts a regular thing. I love Byron Burger, I wish that had them in Bristol. Nom-tastic! Hello there, my name is Vanese and I am a 23-year-old Londoner. My blog documents fashion, beauty and life. Review: 2True Lipstick | Shade 10.